The Hotel York is a 3-star hotel in Riccione, it is very close to the sea and just a few minutes from the center. The property has parking, heated swimming pool with solarium and garden, free WI-FI available throughout the entire hotel and air conditioning. No pets allowed. 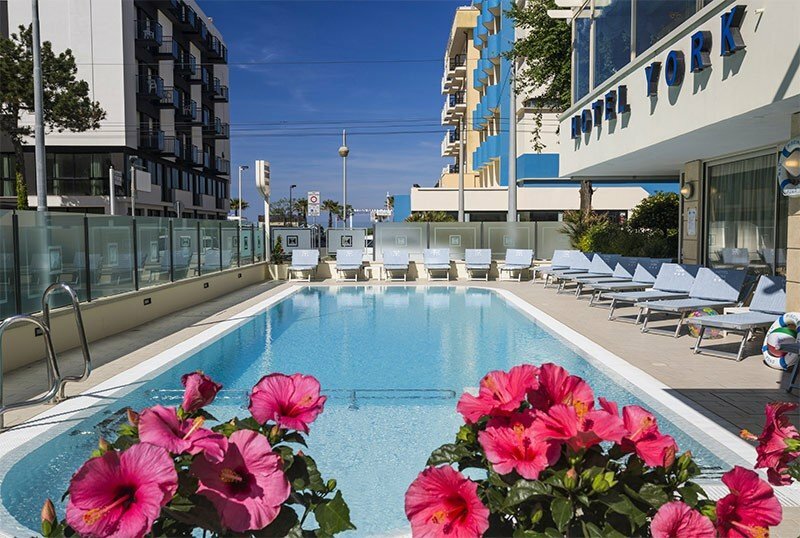 The hotel is in Riccione, in the central area, a few steps from the sea. Behind it is Viale Dante, the pedestrian shopping area that takes a few minutes on foot to the center and to Viale Ceccarini. Nearby, always within walking distance, are the city park and sports facilities. You can reach the Terme di Riccione in about 5 minutes by car. All hotel rooms have: private bathroom with shower and hairdryer, balcony (also with partial sea view), air conditioning, direct dial telephone, WI-FI, safe, LCD satellite TV and digital terrestrial, electric shutters and free minibar . FAMILY: 16 sqm rooms that can accommodate up to 4 beds. The hotel has a large garden with tables, swimming pool, living room, bar, reading room with newspapers in common use, elevator, free use of bicycles. PARKING: uncovered (subject to availability). Carport and garage: on request and for a fee. BREAKFAST: sweet and savory buffet, table service of hot drinks, homemade desserts, fresh fruit, cheeses and cold cuts. Breakfast can be served in the garden. LUNCH AND DINNER: 4 choice menus, vegetable buffet, salads, appetizers, cheeses, desserts. In hotel: strollers, swimming pool with maximum depth 60 cm, baby sitter and pediatrician (both on request). At meals: baby menu on request, seats at the table, flexible hours with meals. Heated pool in the garden, suitable for small and large, surrounded by a sunbathing area with loungers. The hotel has an agreement with the Bagni Lido delle Sirene, 101-102, with floating beds, hot showers, free vouchers for pedal boat rides, canoes, fitness area with step and exercise bike, small bocce courts, bike parking, infirmary, trampoline , playground, mini soccer and beach games (buckets, shovels, molds ...). , sweet gymnastics and aquagym organized by the Cooperative Bagnini of Riccione of which the hotel is a member. The prices of the price list are per day per person, for a stay min. 3 days. TOURIST TAX: excluded. € 1.80 per person per day for a maximum of 7 consecutive nights, excluding children under 14 years. - FREE drinks: Until 14 June, staying for a minimum of 5 days, drinks are FREE! Book a holiday of at least 5 days in the period 25 May 14 June. 1 child up to 13 years in room with two adults is FREE. The offer can not be combined! In Riccione in the family for a few days of relaxation on the occasion of Easter weekend. Family Plan: 2 adults + 2 children without age limits pay 3 full rates. On the occasion of the Tecnocasa convention in May 2019, here are our packages, prices per person for a minimum of 2 nights. Request a free and personalized quote!